Our event is about honouring the whole family. Our aim is to help women (and men) to learn how to trust, support and nurture their innate ability and wisdom to give birth and parent. 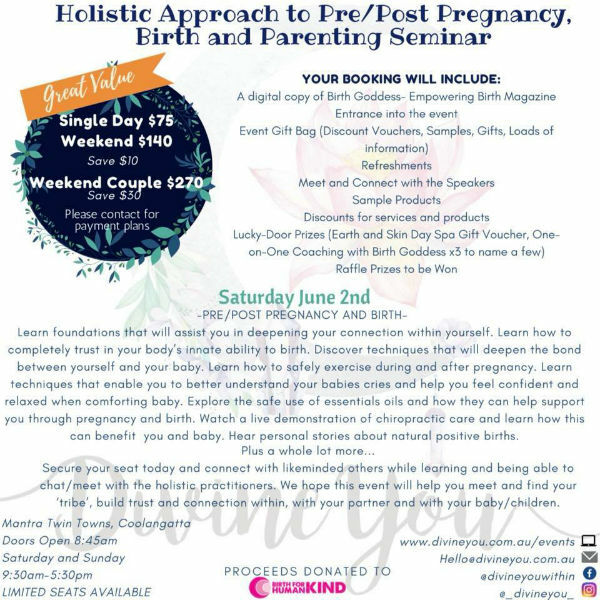 Experienced holistic practitioners will be sharing advice, techniques and knowledge that will support and guide attendees through natural conception, pregnancy, birth and parenting. There will be 10 speakers over the weekend speaking on topics such as: Exercising during pregnancy and post birth, Benefits and Safe use of essential oils during pregnancy, birth and post birth, the benefits of using a Holistic Chiropractor and Kinesiologist for pregnancy and after for mother and child, Hormone Imbalances and Natural Fertility, Aware Parenting, How to be the supporting partner through pregnancy, birth and post birth, Non-Violent Communication, How to support the development of secure attachment and foster resilience and more.